8 June brought Patsy & Phil Thorpe representatives of Blue Trouser Records to the Fiery Bird Show to talk about the ethos of the collective – a set of musicians who set up a non profit support network, nights and opportunities for musicians in and around Surrey & Hants. 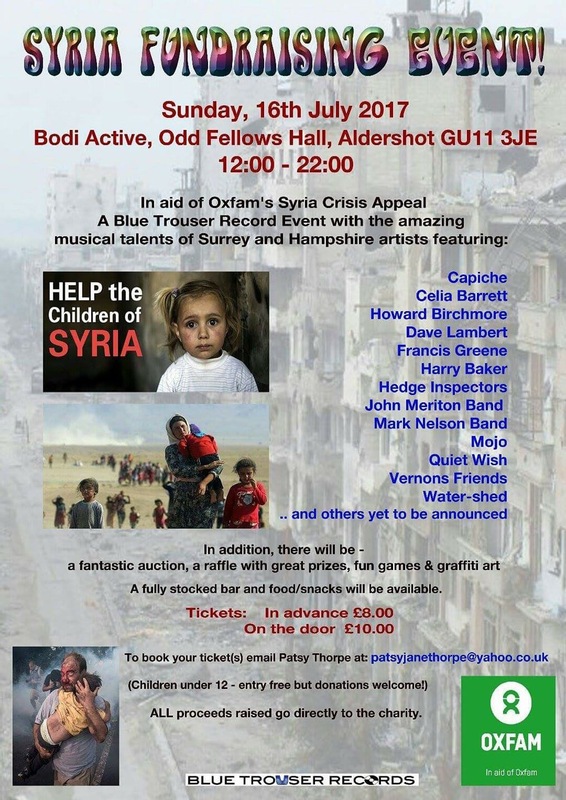 Named by the founder Mark Nelson – who incidentally was playing in Woking on Saturday and it should be noted wore RED trousers (tsk tsk Mark) – they have released a compilation CD and run a number of fundraising nights, mainly for Oxfam. 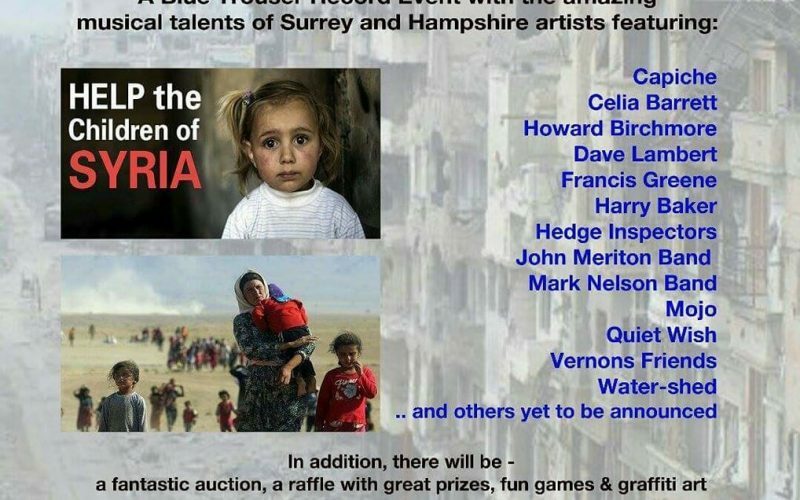 Another one of these events is coming up on 16 July running from 12pm to 10pm with musicians playing all day to raise money for the children of Syria displaced or needing medical attention following the military interventions there with the money going to Oxfam to distribute. Hear about the line up of the day and the fantastic raffle/auction prizes that are available including something Phil was incredibly lucky to track down and had to fight with his own conscience to put into the auction when everything in him screamed to keep it – it was like his own version of the ring obsession with Lord of the Rings but, charity prevailed and we are all the better for it. I also had a phone chat with Stephen Colegrave co-founder of Byline, the inaugural festival which took place 2-4 June in Pippingford East Sussex and returns next year over the August Bank Holiday Weekend. Stephen was updating us on how the festival went and what plans they have. As a response to the fake news agenda that has risen over recent years he felt that the festival addressed many people’s concerns by bringing together different viewpoints and generations to see a more positive future, mix into this comedy, music and workshops in a great setting it made a great weekend for a lot of people. Earlybird tickets currently at £30 (for a couple of days left at this price) are available from the website; after that they increase in stages to the eventual full price of £120 for the weekend.